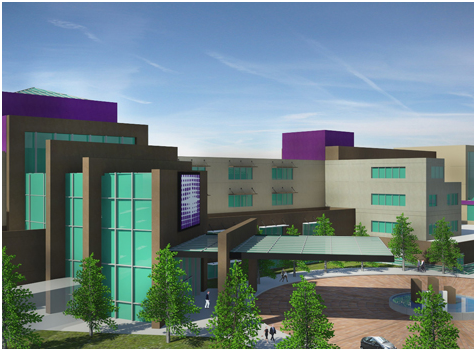 Henrikson Owen and Associates is teamed with Kluger Architects to provide mechanical, electrical, plumbing, structural, and civil programming, design engineering, and construction support services for the new In-Patient Tower 2 Project at Tulare Regional Medical Center (TRMC). Tower 2 at TRMC is an 111,100 square foot addition to the current hospital campus. Its estimated project cost is $25,000,000 for Phase 1. It is planned as an architectural and functional extension of the existing tower. The Tower 2 addition consists of a four-story above-grade structure, plus a basement. It is intended to house up to 105 patient rooms and medical and technical support functions on the four floors. The basement houses administration and related medical and technical support functions. It also includes access ramps and loading docks. An atrium will provide the main entrance to the tower and will connect it to an adjacent existing tower. The project is divided into separate phases and increments for plan checking and construction purposes. The first phase is to include master planning, programming, shell and core for the entire 111,100 square foot structure with design and build-out of the basement and first floor. The work includes mechanical, plumbing, and electrical systems and equipment, fire sprinklers, four elevator shafts for all four levels, and relocation of central medical gases for the campus, along with site civil and road realignment. Two incremental packages will be developed for the Office of Statewide Health Planning and Development (OSHPD) for fast-paced approval and construction start scheduling. The interior design of tenant improvements (TI) for the first through fourth floors will be finished at a later date under a separate design and construction process.